Accern is here to take the side of retail investors and supply them with sophisticated news research analytic tools to be on par with similar technologies used at institutions and hedge funds. Institutional investors have been known to manipulate the market whereas retail investors are always following what they hear in the media. The Big Data Era has left retail investors more vulnerable to institutional investors now more than ever due to all the noise being released in the media. Our mission is to create a level playing field for retail investors when it comes to trading. Kumesh Aroomoogan is the co-founder and CEO of Accern and currently a senior at Pace University majoring in Public Accounting. He had pursued various startups in the past with each possessing its own lessons which was transferred to Accern, his current startup. Prior to startups, Kumesh had held positions as an analyst and accountant at Citigroup, SIFMA, and Ford Foundation. In addition to work, Kumesh likes to attend various networking events where he have made connections and friends with industry leaders, advisors, startup entrepreneurs, and much more. Omicon Entertainment, Inc. is an event production company based in New York that takes a special interest in providing affordable and eventful projects for the millennial age group. Omicon Entertainment sells live-event experiences. Using state of the art venue resources, advanced production capabilities, experienced event planners, reliable promotional strategies and a wide array of talent-booking connections, Omicon Entertainment has been able to achieve a top-notch reputation in the live entertainment community and has over 60,000 attendees combined. Today, Omicon Entertainment, Inc. is a subsidiary of Omicon Group Inc. employing full time event professionals and operating from Wall Street in NYC. Our proficiency, vision, intuition and creativity propel our team to reach more fans across all media platforms in order to deliver a greater significance to entertainment culture. Now Omicon Entertainment is expanding into the technology world with a nightlife application with partners Jake T Austin, actor on the Fosters on ABC, Alex Shlaferman, owner of Vante Toys, and international entrepreneur Mehedi Hasan. Kazi is the Founding Partner and CEO of Omicon Entertainment, Inc. After completing his first year at Pace University, Kazi was on a mission to throw his first party. Kazi is an ambitious, self-confident person and wasn’t content settling for being an ordinary event planner. TechSuite is the software developer for promising startups, innovative enterprises, and ambitious SMBs with no time to waste. We design, develop, and deploy digital products more efficiently than anyone else, ever. We support challenger brands wholeheartedly with lean and flexible offerings to help them scale rapidly. We bring new, disruptive technology and creative solutions to key industries to accelerate innovation worldwide. We want to democratize the whole product development process so that the most powerful ideas in the world can come to life. Samuel Corso is an BBA, Business Management student with minors in Finance and Quantitative Business Analysis at Pace University on the New York City campus. He has diverse professional experience as an entrepreneur, software developer, and product manager. He spent eight years as a recreational coder, web freelancer, and bot developer before becoming the CEO and Co-Founder of TechSuite. He has worked with over 50 startups on product strategy, design, development, and digital marketing. Mr. Harrison is presently a full-time student at Pace University pursuing his MBA in Strategic Management, where he is also a Graduate Assistant at the Entrepreneurship Lab. Beyond his studies, Mr. Harrison completes consulting work for a technology start-up in the food service industry and as the Finance lead for a Biopharma start-up that is specializing in stem cell research. Furthermore, Mr. Harrison is the acting Controller for Some Spider LLC, a digital media start-up with annualized sales of over $1.5 million. Lastly, John has been a small business owner since 2014 when he purchased, remodeled, and rebranded a bar & restaurant in San Angelo, TX. Having graduated Lehigh University with a Bachelor’s of Science in Accounting and Finance in 2005 John chose to pursue his professional interests at Johnson & Johnson. Over the next eight years John took on increasing levels of responsibility rising to the position of Senior Manager before leaving J&J in 2013. Mr. Harrison left corporate life to pursue his MBA as he desired the opportunity to be in a faster paced and more agile environment. The opportunity to make decisions that actually impact business outcomes has led John to make the leap into entrepreneurship, and has inspired his efforts to create MugClubs.com. VRAN allows developers of virtual reality apps and games monetize their content by introducing product placements within their current applications. We give ambitious advertisers the chance to engage with an increasingly popular and immersive customer base of virtual reality with 100% transparency and control of their advertisements, data and analytics. Unlike other advertisement networks, we feel as though ads should enhance the experience, not interrupt it. We have a full dashboard for both developers and advertisers to track engagement on another level that was once not possible. I am a mobile and web developer for over 5 years and a sophomore at Pace University, and am originally from Pennsylvania. I've designed, developed and published many apps and websites over the years and made the transition to virtual reality in the beginning of Summer 2015. I'm really excited about the future and creating the virtual reality paradigms of tomorrow. Sharped is a mobile application that serves as an on demand platform that connects students within the same university only for tutoring purposes. Qualified students have the choice to either sign up as "student tutors", or students can just sign up when they need help for the class. This service will help students who need immediate help for a class, who want to keep their grades up, and who want to save money. The average tutoring session will cost $15-25 an hour, and students can save up to $10 dollars when going as a group. Student tutors will also benefit by being able to have a job that offers them a flexible schedule to tutor at their convenience. This is a win-win situation for both parties. Andrew Morales is the co-founder and president of Sharped. He is pursuing a Marketing degree with a concentration in Advertising and Promotion. Andrew is one of the founders of Kappa Sigma Fraternity at Pace University. He is also Director of Events of the Advertising Club. Andrew grew up in England and Italy and is fluent in Italian and Spanish. He enjoys travelling, exploring new places, participating in competitive soccer and playing guitar. Burassi is a New York based street wear brand that was launched in 2012. Since launch, the brand has amassed sales in almost all 50 states and over 15 other countries and continues to expand with each release. The brand is currently sold through the online website and is also available in various online retailers as well as a few local boutiques. It’s current goal is to continue expanding into major retailers both in-store and online and to make a full transition from producing printed shirts to 100% custom cut and sewn manufactured products such as jackets, pants, and more. Gregory Matarazzo is currently an undergraduate marketing major in the Lubin School of Business at Pace University. He is originally from New Jersey but chose to go to school in New York City to pursue his entrepreneurial passions. In his free time Gregory enjoys sports, traveling, and networking with fellow entrepreneurs. Foodie Out Loud was founded by “foodie,” Megan Peterson. Foodie Out Loud is your guide to the best eats from breakfast to dessert, featuring the best restaurants in New York City. After eating and photographing, Megan uses her innovative marketing strategy powered by blog and photo to feature the best eats to the general public. On her website, you can read about, see photos, access menus, and make reservations for her highly recommended restaurants. Megan Peterson is a senior BFA Commercial Dance major, and Arts & Entertainment Management minor at Pace University. Megan founded Foodie Out Loud while photographing good eats she found upon moving to downtown Manhattan in 2014. After posting mouth watering photos to her personal Instagram account, she found herself being a concierge, suggesting restaurants for any occasion to other students and newcomers to the NYC area. Due to an overwhelming flood of texts, calls, emails, and stopping her in passing, she created a website, an Instagram, and Twitter account to continue guiding the community to good eats. A year later, it led to photography, and media marketing freelancing for New York City restaurants. Cross River Games is a video game development studio dedicated to producing quality games. Its first game, Endless Fall, is currently in development for iOS. Cross River Games intends to expand to other platforms including Android, PC, and consoles. Douglas Pope is the founder and sole proprietor of Cross River Games and a senior at Pace University majoring in Computer Science. He started his first business, Pendleton Summer Duck Cookies, at the age of nine and since then knew that entrepreneurship would be the career for him. In his spare time, Douglas enjoys playing computer games. Piximity is an anonymous location-based picture feed that lets users see what is happening in their area or anywhere around the world. Users can filter pictures by when they were taken, how close they are, or how popular they are. Sharing through the app is easy - take a picture, add a hashtag and upload. It’s all anonymous so users can focus on the pictures, not the people taking it. It’s a brand new way to discover through photography. Daniel Shaffer is a senior at Pace University. In 2008, he started Redwheel Apps, an iPhone application company, launching his first app the day the store launched. 6 years later, he has accumulated over 1.5 million downloads, with two apps reaching #5 on top free and top paid. Besides running his own company, he spent two years interning at UBS, making mobile software for the executive team, and recently spent a summer at The New York Times, where he worked on the main news reader app and created a new app. Currently, he is the CEO of Piximity, an anonymous location-based picture feed. In addition to software, Daniel is an avid drummer and stock market investor. AIT was founded by a high school sophomore in 2010 and is continuing to grow across various sectors, including Franchises, Corporate Chains, Small Businesses, Technology Startups, Counties, and eCommerce. AIT has enabled its customers to be game changers in their industry through disruptive and innovative solutions. Our excellence and performance has facilitated our clients ranging from individual entrepreneurs to fortune 500 companies in reducing costs and making operations smoother and more efficient. Today, AIT continues to grow by gaining market share rapidly through innovation. We enjoy bringing solutions to our customers that contributes towards their success, we believe as our customers grow, we grow. Amit Shah is the Founder of AIT Consulting Solutions, and started the company during his sophomore year of high school. He wants AIT to provide technology solutions that can impact individuals and businesses in a positive way. Amit was recently recognized as one of the top 40 entrepreneurs under the age of 40. Amit enjoys working with the entire AIT team because his technology skills were born from passion and curiosity. He enjoys solving challenging issues and being a team player. Exceeding our customer’s expectations is a core principal to Amit. Cairan provides online courses to Iranian students planning to study in the United States. Online courses deliver content on everything that an Iranian student should know before coming to the USA such as advice on preparation, budgeting, and visa process. The company is revolutionizing the whole process of study abroad by bringing the content with online videos. Our mission is to bring the highest value content in the market online where prospects can access wherever they are. My name is Mehran and am founder of Cairan Consulting Agency. I came abroad to study when I was 16 years old. I first went to England and then I decided to finish my high school in the United States. After my high school graduation, I made the decision to join entrepreneurship journey because you do what you like and serve your community at the same time. I like entrepreneurship because we create products and services that improve your life. “We rise by lifting others”. Brownstone Bee (BB) will be a manufacturing business that will sell all natural beeswax cosmetics and candles. The company has three missions: a social mission, sustainable mission, and an economic mission. Brownstone Bee will sell their products business to business. Its target businesses are boutiques, all natural food stores, eco-friendly cafes, hair salons, nail salons, and eco-friendly restaurants. BB will officially launch this summer 2013 and begin selling in Astoria, NY. As the business grows, BB's target locations are L.I.C., Williamsburg, West Village, East Village, and Soho. Spiridoula is a senior Political Science student concentrating in International Relations. Political Science has enabled her to think critically and analytically about the world. She has conducted theoretical, qualitative, and quantitative research in the topics of her interest. Spiridoula's academic, professional, and personal work experience has helped her to discover that she has a real passion for social entrepreneurship. Spiridoula sets out to creatively apply her skills and experience to building a strong business model for Brownstone Bee. On her spare time, she also runs a small business painting and selling Byzantine icons. Her interests are Theology, foreign politics, social entrepreneurship, the arts, architectural design, crafting, creating, and green living. Spiridoula is an action oriented visionary and aspiring social entrepreneur. She will combine her skills to serve a single purpose (@BrownstoneBee). Nova Software designs software designated for food and beverage establishment. It will create programs that will handle financials and logistics of running small businesses all the way up to large facilities such as hotels or franchises. They key focus is to make a restaurant owners life more organized and efficient. 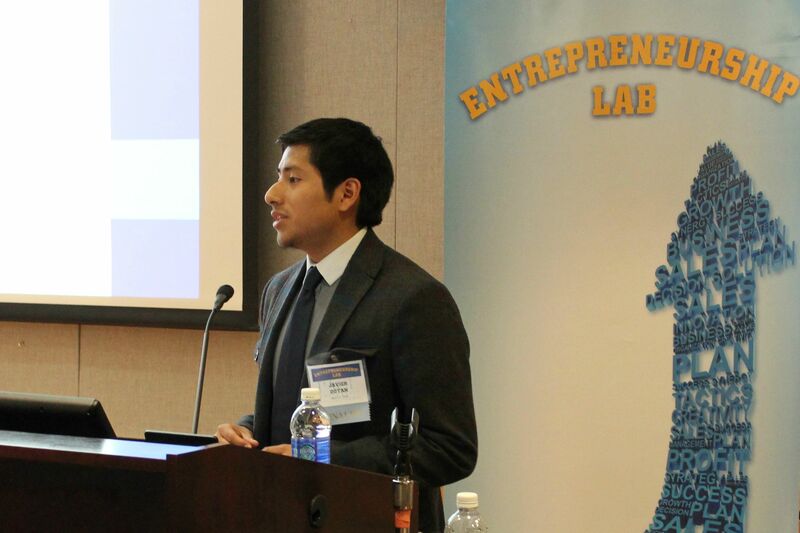 My name is Javier Dutan, I am a Junior in the Lubin School of Business at Pace University. My major is Management with a concentration in Entrepreneurship with an expected graduation date of May 2014. I have experience in many different fields ranging from Photography, Web Design, Marketing, and Financial Analytics. The Jewel High Collection provides exquisite luxury footwear for women of sizes 6 to 15. Each shoe offers comfort and is enriched with our signature orange lining. I introduce "Poison" and "Tami", which are the first two styles of my collection. "Poison" is a 5.5 inch platform sandal that will leave others breathless. "Tami" is a beautiful 5.5 inch D'orsay platform pump with an interchangeable ankle strap that represents growth and elegance. I have worked extremely hard over the past 5 years to make my childhood dream a reality. Jewel T. High is a Pace University BBA General Accounting candidate for May of 2013. During her college experience, Jewel became a certified HIV/ AIDS Awareness Trainer for CDC and Sigma Gamma Rho Sorority, Inc., scholarly writer for Dyson Society of Fellows, and a Northeastern Regional and International Award Recipient of Sigma Gamma Rho Sorority, Inc. for outstanding achievement and providing meritorious service. She is now the CEO and Creative Director of Jewel High Collection, exquisite luxury footwear for women of sizes 6 to 15. Jewel T. High strives to make sure all women have a chance to walk with style and confidence by accommodating women with large shoe sizes. While rigorously studying accounting, Jewel took art classes at the Art Institute to enhance her design skills, researched the footwear industry, and studied under a mentor with over 30 years of experience in the footwear industry. Jewel High Collection is currently an e-commerce business with plans to be accessible at high end department stores and boutiques. Ravasco Transmission Pvt Ltd. is one of the largest manufacturers of conveyor belts, rubber and electric sheets, EPDM roofing membranes and PVC fabric. The company was established in Mumbai, India, in early 1980s and has since been a key competitor in the Indian market as well as the global market. It has four different manufacturing units located in the state of Gujarat, and serves markets such as mining, steel, cement, OEM (original equipment manufacturers), shipping, etc. The company has grown consistently and rapidly, year after year and so has been able to expand its portfolio by acquiring Madura Industrial Textiles (MIT) in 2003. MIT produces polyester and nylon fabrics, which have many applications such as automotive, aviation, conveyor belting, medical, etc. MIT recently expanded its operations to create a phase II and has set an example of how operations should be run in the industry. Exports are very crucial to a producer of commodities or finished products because increasing number of producers are coming out from every corner in the local market. To be able to hedge the risk of losing customers in India, Tarun Kalra, Director of Ravasco, has taken the initiative to establish a strong clientele in North and South America. 40% of Ravasco’s annual revenue is from exports, but Tarun wants to grow that number. He started working at Ravasco in May’09 as a personal assistant to the CFO of the company where he created pricing quotes for products and interacted and negotiated pricing with clients. He went on to train as a floor manager for one of the manufacturing facilities and acquired comprehensive knowledge about the products and the industry. Tarun Kalra is a senior at Pace university pursuing a BBA in finance, and wishes to create a financing part for Ravasco and MIT, like GE Capital, sometime in the future. UrbanNYCProperty is an exclusive real estate firm that focuses on new developments in the Downtown Brooklyn area. Our strategy is to become the one of the most reputable real estate firms in Brooklyn. We offer round the clock service to a few well qualified individuals. Our goal is to make buying and selling of real estate as simple as possible while maintaining the highest level of service. We offer an efficient buying process and sound real estate advice. Our negotiation skills and ability to close deals saves our clients both time and energy. We strive to make the process of buying and selling a memorable experience for our clients. Venture Forth Analytics is a question based tool for identifying and evaluating the business opportunity present within the user’s idea for producing a product or service. The idea presented for evaluation can be a new, innovative concept based on cutting edge technology, or it can be a new incarnation of a long lived and proven product or service. The output of the program is a comprehensive, cross-section report that details the strengths and potential key weaknesses of the business concept. Though no explicit advisement is provided on whether to pursue the new business, the report is intended to act as a guideline for the potential founder(s) on the odds for success should they decide to do so. The report is also intended to provide constructive criticism on how the idea could be improved, as well as identify key factors in the success or failure of the business that the founder(s) either didn’t recognize or didn’t prioritize in thinking up their concept. Leah is an MBA student in the Lubin School of Business majoring in Entrepreneurship and Information Systems. She has an academic background in both finance and computer science and is committed to helping startup businesses increase synergy where technology intersects with business operations. In addition to developing the analytics program that is the cornerstone of her business, Leah is currently working with several small businesses as a freelance consultant. She has professional experience as a data analyst, writer, and event analyst. Blue-Green Solutions (BGS) is Jamaica’s only producer of B100 biodiesel. BGS strives to provide its customers with quality biodiesel and timely delivery to meet their energy needs. Geordi Taylor is an undergraduate Economics Major who is currently utilizing the tools of the entrepreneurship lab at Pace University to construct a business plan and for a biodiesel production facility in his home-country of Jamaica. Geordi hopes to provide Jamaican businesses and citizens with a cheaper alternative to high-priced petroleum diesel by producing B100 (100% biodiesel) while providing a means for them to reduce their carbon footprint on the environment and our atmosphere.